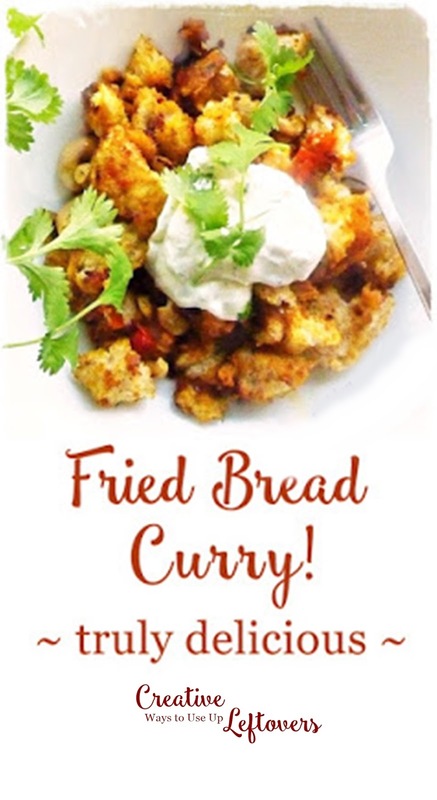 Fried Bread Curry aka Roti Upma - really good! Well I have just eaten A Very Interesting Thing which was also quick, cheap and used leftovers but I doubt very much that it was healthy. - fried bread curry! Upma is a actually a South Indian porridgy dish usually made with semolina but also with lots of other things that will mush down such as rice or bread. 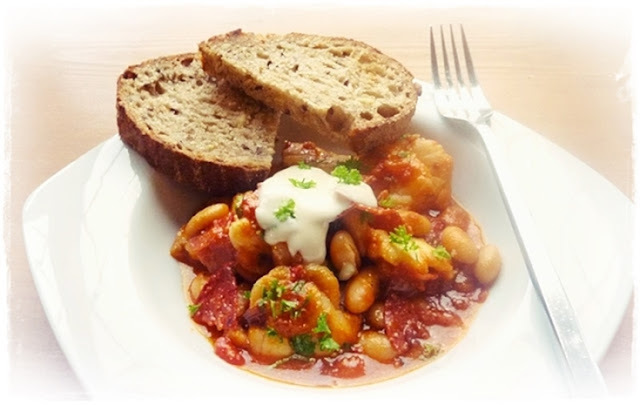 I don't like porridgy things so have never tried it and so didn't feel I could rightfully include the bread version in my bread section of Creative Ways to Use Up Leftovers (see below ***). 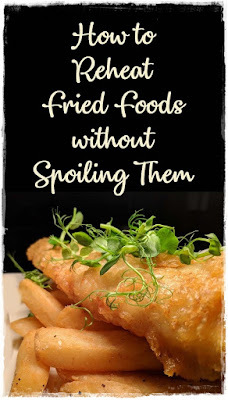 Recently however I have noticed a few Upma recipes using dried or fried bread which retains quite a bit of crispness so decided to give it a go. Serves 1 ~ a somewhat inauthentic recipe because I didn't have all the right ingredients! ~ Heat ½ tbsp oil in a frying pan then fry the bread in it till turning crisp and golden. Set aside. ~ Add the second ½ tbsp oil to the pan and then the mustard seeds and wait till they start popping. ~ Stir in the onion (and the ginger if you've got some) and cook till starting to go translucent then add the chilli and the tomatoes. ~ When the tomatoes start to mush down stir in the turmeric and/or curry paste and cook together a minute or so. 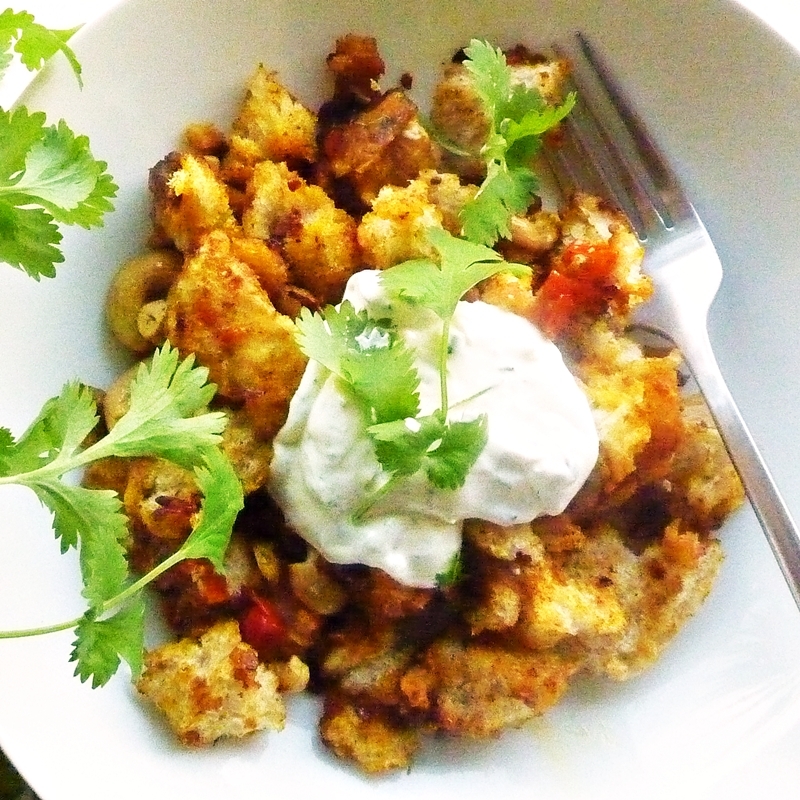 ~ Taste and season then stir in the bread, cashews and chopped coriander. I stopped at this point because I don't like pappy meals but you could cook the mixture down a bit and maybe add a little hot water to achieve a more porridge-like consistency. As I say, it was great and next time I feel I have been eating too healthily I intend to balance things up by making it again! *** In this book I give all the information, ideas, recipes, handy hints, cook’s treats, storage info, ideas of what goes with what that I can think of for over 450 possible leftovers including at least 16 ways to use up leftover bread. My friend Diane recently gave me a bottle of single estate extra virgin olive oil, her son’s Italian girlfriend’s father grows olives and presses his own oil and it is lush. 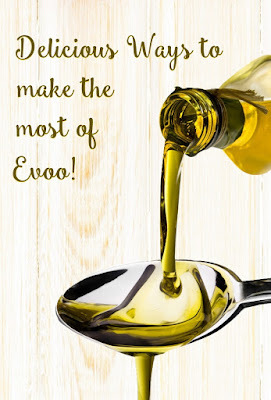 So, it seems the right time to do a post on delicious ways to use extra virgin olive oil aka evoo! I am not, in this post, going into the details of cooking with extra virgin olive oil. It was long held that high heat damaged the oil but recently this has been disproved and evoo is held to be one of the better cooking oils. However, if like me you have a delicious oil to play with don’t cook with it, these ideas will make the most of its flavour. Rich greeny/gold extra virgin olive oil both looks and tastes good drizzled over many dishes such as soups, salads and hummus and other bean dips. ~ Stir in a little balsamic vinegar – the two go very well together. ~ All three of the above simultaneously – yum. ~ Finely grated lemon zest and parsley or black pepper. ~ Freshly chopped herbs or dried herbs. ~ Finely grated Parmesan cheese. ~ Crushed chilli flakes – I have some chipotle chilli flakes and they work well. ~ One of the infused oils below. 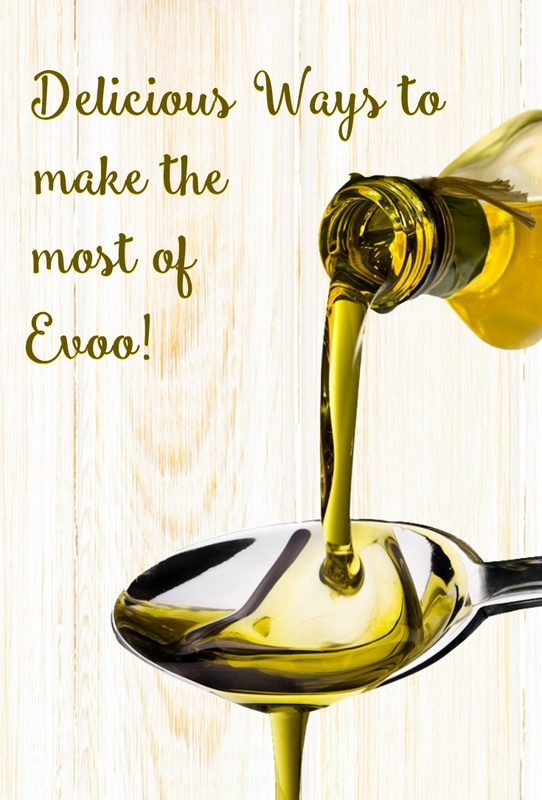 Delicious oil is essential when making salad dressings, see here for lots of vinaigrette ideas all of which will benefit by using evoo! ~ Parmesan Oil – this is a great idea for leftover parmesan rind; marinate the rind in olive oil together with flavourings such as peppercorns or chilli. Discard the rind and use the oil to drizzle or dip. ~ Chorizo Oil – see here. 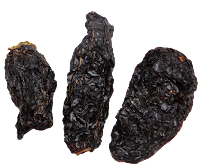 ~ Black Garlic Oil – see here. 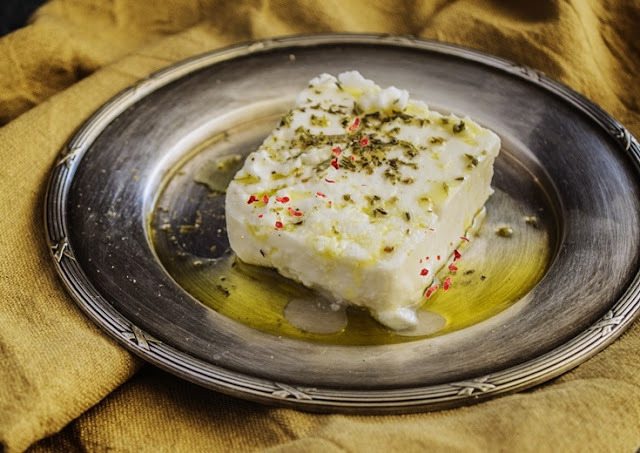 Certain cheese, such as Feta, Mozzarella and goat cheese, are good marinated olive oil together with flavourings as you fancy. ~ Cut the cheese into bite sized pieces, softer cheese such as goat cheese can be rolled into balls. ~ Toss the cheese with your chosen seasonings. ~ Layer the cheese up in the jar with any additions. ~ Pour in enough olive oil to completely and utterly cover the contents of the jar – nothing should be sticking out. ~ Seal the jar and store in the fridge for up to month. This is a classic Italian dish. ~ Warm the oil and add the chilli and garlic, cook over a low heat until the garlic is just turning golden. ~ As soon as this happens stir in the parsley set aside till the pasta is cooked. ~ Cook the pasta in plenty of boiling well salted water (this will be the only seasoning) till just cooked or al dente as we cooks say! ~ Drain but not too thoroughly, a little cooking water will enhance the sauce. ~ Make sure the oil is still hot and then toss together with the pasta. This can be varied quite a lot – use basil instead of parsley, add olives or artichoke hearts or chopped tomatoes or sun dried tomatoes or finely chopped red onion etc. And I would sprinkle the finished dish with freshly grated parmesan and probably some crunchy pangrattato!!! A handful of coarsely chopped fresh herbs of your choice – probably parsley, basil etc. 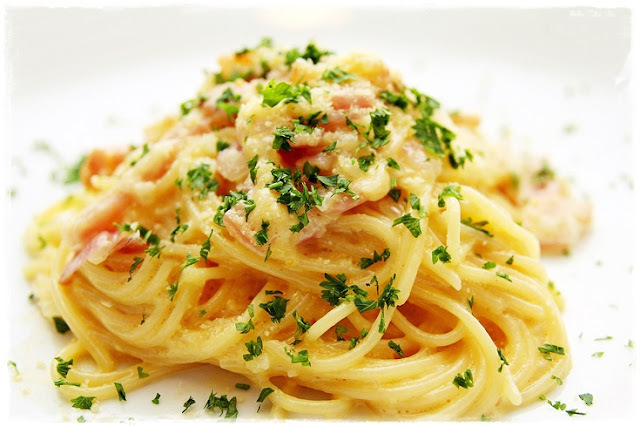 ~ Cook the linguini in boiling salted water to al dente, drain, reserving two tablespoons of the cooking water. ~ Gently cook the garlic in the olive oil till fragrant. ~ Add the reserved pasta water to the garlicky oil, simmer, turn of the heat and stir in the herbs, lemon zest and juice. ~ Stir in the optional butter – go on! ~ Toss with the pasta and, of course, season to taste. Serve as it is or add whatever you like really (seafood, chicken, bacon etc.) to make a more substantial meal. ~ Place a chunk of Feta on a piece of lightly oiled foil. ~ Drizzle with lovely olive oil and season according to preference. I usually add oregano and chilli flakes but roasted garlic is good too. ~ Loosely seal the parcel and bake in a hot oven (200°C/400°F/180ºC fan/gas 6) for 10-15 minutes depending on the thickness of the cheese. ~ Serve with crusty bread and red wine. In two stages as the ingredients are somewhat repeated! ~ If the potatoes are large cut them into attractive bite sized pieces. 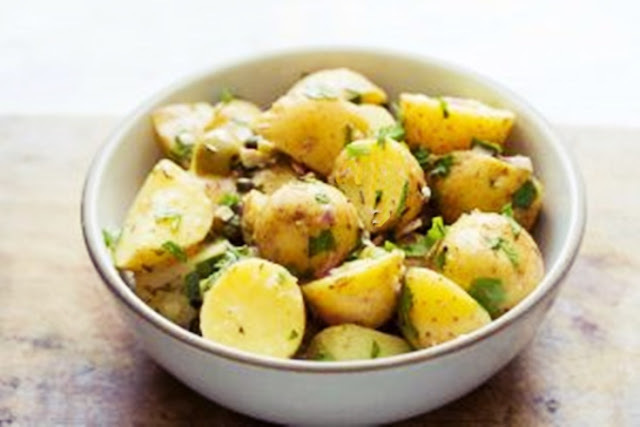 ~ Cook the potatoes in gently boiling water for about 15 minutes till tender. ~ Drain the potatoes, cool for a few minutes and then toss gently with the dressing and set aside for about half an hour. ~ Stir together the above five ingredients over a low heat till just warm. ~ Stir through the potatoes and serve. If making ahead just re-warm the salad slightly when serving. Your selection of the kind of sandwich fillings you think a French person would use! ~ Slice the baguette in half lengthwise and scoop out the soft bread from the bottom half. See here for lots of ideas for leftover bread – don’t waste it! ~ Brush inside both halves of the sandwich with the oil. ~ Rub each half with a cut clove of garlic. ~ Make a salad using your choice of ingredients. ~ Dress the salad with the vinaigrette. ~ Pile the dressed salad into the scooped out half of the bread. ~ Put on the lid and wrap the whole thing in cling film/plastic wrap. ~ Put in the fridge with a weight on top of it to crush all together – a heavy pan for instance, or a brick? ~ Unwrap and cut in half to serve (with some red wine and maybe some cheese depending on your other ingredients). Do see here for how to make this delicious Greek Grilled Bread, it’s really worth knowing about! Do you know I am So Old I can remember when you could only get olive oil in a tiny bottle from the chemists - I wonder why! I was chatting with a friend the other day about cooking in Tortola (“Where?” he said, as usual, because he’s fed up with me mentioning the lovely place I used to live, lucky me!) and how I missed chipotles in adobe; canned smoked chillies in a tangy tomato sauce which I haven’t seen in the UK. He suggested I try Asda’s Chipotle Paste and I did, and now I am hooked and chipotle paste has become another of my must-have store cupboard staples. If you do invest in some I urge to test it tentatively before using it as it can be quite (but not very) fiery. I use about half a teaspoon in most things I make just for myself but you might feel differently. 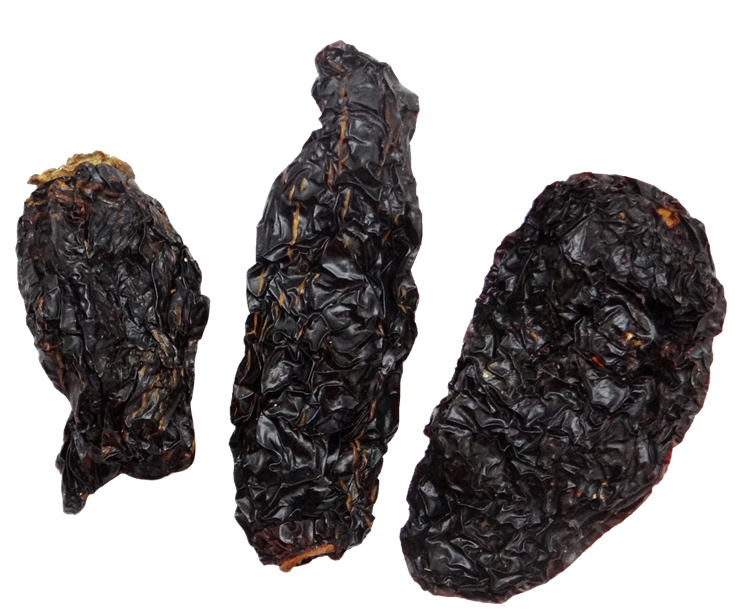 Chipotles are smoke-dried ripe jalapeño chillies. They are medium hot and look like this – happily looks aren’t everything! I do have dried chipotles in my storecupboard too, but chipotle paste is a much easier way to add their lovely smoky heat to your cooking. Stir chipotle paste into the ketchup to taste, I really like this with egg and chips! Taking the above a little further a REALLY CHEATY pizza sauce which these days I use all the time is a mix of equal parts tomato ketchup and tomato paste. You can frown in my general direction if you like! For myself I add half a teaspoon of chipotle paste to my portions of sauce but, not, of course, for my real man. You can add a little chipotle paste to more sophisticated pizza sauces too. Quite often I cook a pie for my real man, steak and kidney, chicken and leek, that sort of thing. With the puff pastry trimmings I always make us some cheese straws to nibble on while the rest of the dinner is cooking. All I do is roll out the pastry, sprinkle with grated mature cheddar, fold in half, sprinkle and roll, fold, sprinkle and roll about 5 times. I then cut into strips, brush with egg yolk, sprinkle with sea salt and bake along with the pie at 200°C/400°F/180ºC fan/gas 6 or thereabouts. For me I often spread a little chipotle paste on the pastry before the first sprinkle. Lots more ideas for leftover pastry here. This is particularly good with seafood and chicken and lovely to dip sweet potato fries into. Just stir together mayonnaise and chipotle paste. I use about half a teaspoon of chipotle paste to a tablespoon of mayo, sometimes a little lime juice is a good addition. See here for more ideas for flavouring mayonnaise. Liquidise, whisk or shake in a jar the first four ingredients and then season to taste with the salt. 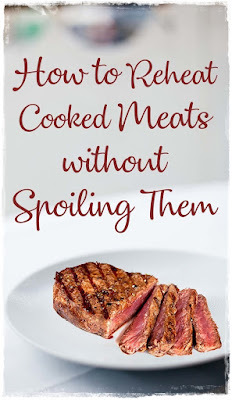 Not only good on salads but makes a great marinade for chicken, seafood and beef. This is delicious served tossed with cooked seafood or chicken and pasta or as a cream sauce for either without the pasta! Just add make this easy Alfredo Sauce and add a little tomato paste for pinkness and chipotle paste to taste. Chipotle goes brilliantly with sweet potatoes try replacing the Thai chilli paste with chipotle paste in this lovely sweet potato soup. ~ Add a little to scrambled eggs – see here for how to scramble eggs properly plus other egg ideas that might benefit from a bit of delicious smoky heat. ~ Add to the hollandaise when making Eggs Benedict – maybe change the name, any suggestions? Easy hollandaise sauce recipe here. ~ Use it in my best omelette ever. This is wonderful on sweetcorn, more ideas for flavouring butter here. ~ Mix a little into Black Bean Dip – see here for hummus and other bean dips etc. 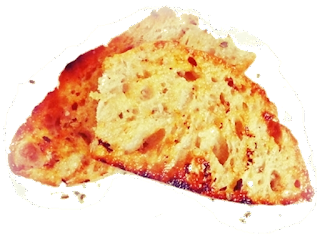 ~ Add to Cheese on Toast – here’s more info for this complicated dish! ~ Gently melt together the first three/four ingredients, taste and add a little salt if you wish. 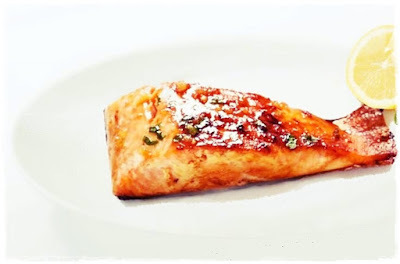 ~ Place the salmon fillets in a lightly buttered rimmed baking dish and pour over the delicious sweet spicy butter. ~ Bake for 12-15 minutes till the fish flakes easily. I have been making this for my dinner for ages and here’s the recipe, but recently have been adding a little chipotle paste to great acclaim from myself. ~ Add to Chilli con Carne and other meaty beany dishes. 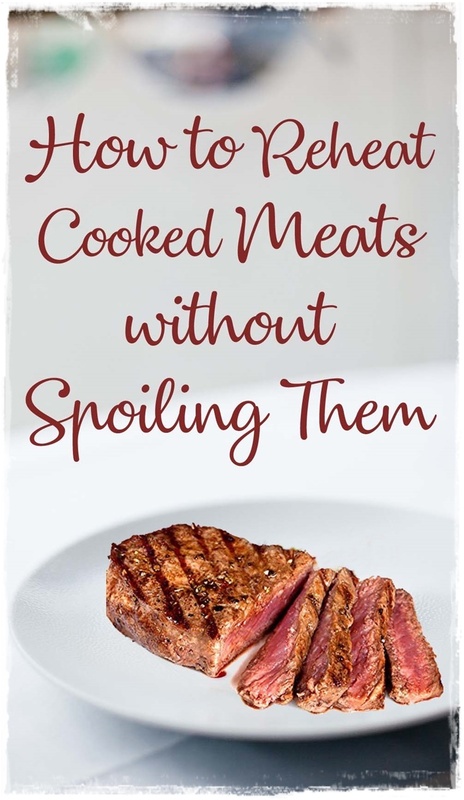 ~ Add to Homemade Burgers, Meatballs, Meatloaf and so on. Homemade burger are even easier than getting takeaway! 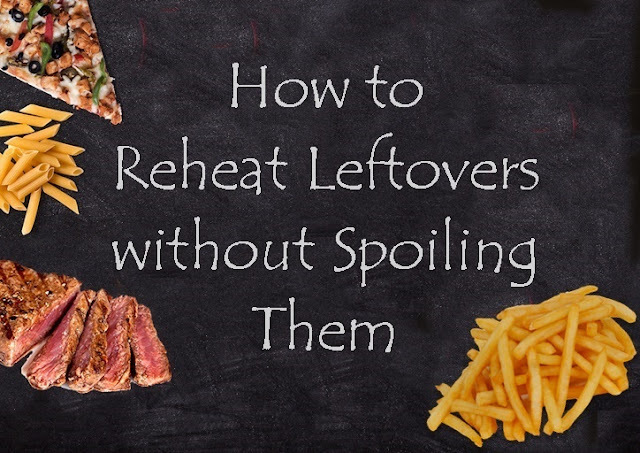 How to Reheat Leftovers without Spoiling Them ~ which is a Good Idea! I think that the practice of reheating food wrongly, either in the microwave or other incorrect methods, is why leftovers have such an (undeservedly) bad name. Leftovers can, of course, be used in so many ways to create completely new dishes and if you are interested in this please see here for 219 Great Ideas for Leftovers but if you just want to reheat your leftovers here’s some useful info. 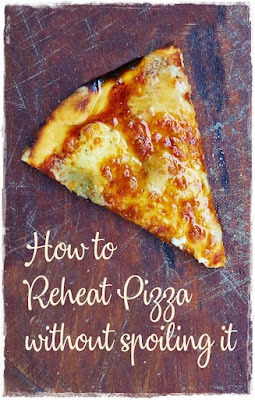 If you don’t have the right equipment or are in a tearing hurry, I suppose using a microwave can’t be helped but it is not the best way to reheat most foods and in particular crisp foods which will not remain or re-crisp in the microwave. It can also damage the texture of delicate items such as fish. Moister foods such as soups and stews will do OK in a microwave if you don’t rush them and give them a stir now and then while heating up. Foods reheated correctly can be just as good as the first time round. Defrost First – this is where a microwave can come in useful, if your leftovers are frozen defrost them overnight in the fridge or do gently on a low setting on your microwave. Bring to Room Temperature – if you must use the microwave, again gently, to just take the chill off your leftover. 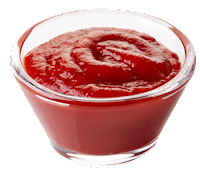 For this you need a generous amount of sauce – either leftovers of the sauce you originally served the meal with, or a freshly made or bought in sauce. ~ Your leftover should be at room temperature so get it out of the fridge in time. ~ If reheating the remains of a roast slice the meat. ~ When ready to cook the meat first bring the sauce to a good temperature, not necessarily boiling but nice and hot. ~ Lay the meat(s) or fish in the sauce, put a lid on and turn off the heat. ~ When ready to eat return to a slow simmer BUT NO MORE – boiling already cooked meat toughens it. Failing a delicious sauce reheat these in a dry pan to which you should add a little oil or butter. Keep the heat low, add your leftover gently, if you put a lid on the pan the meat/fish will heat faster and be moister but will not have a crust. Turn the leftover after about 3 minutes and heat for another 2 or 3 minutes before serving. Just reheat gently in a saucepan with the lid on. Keep an eye on it and give a stir now and then. DO NOT BOIL. The microwave is fine for these foods too. These should NOT be done in the microwave which will make them soggy. ~ Preheat oven to 190ºC/375ºF/170ºC fan/gas 5 or thereabouts. 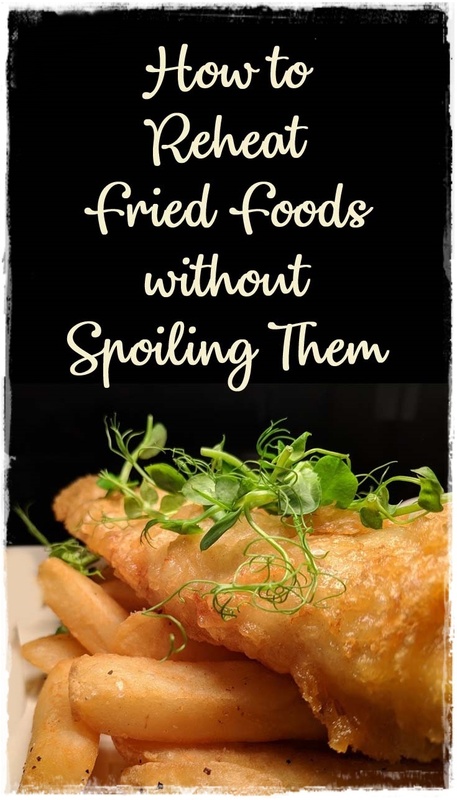 ~ Place your room temperature leftover fried food on a baking tray and bake till hot and crisp which will of course vary according to what you are reheating. Incidentally see here for all sorts of coatings for fried foods. 1. Oven – do the same as with fried foods above. 2. Grill – preheat the grill and place a baking tray underneath it so that it heats up too. This is important as it will crisp the bottom of the pizza while the grill reheats the top. Grill the pizza till hot, keeping an eye on it as being thin it will cook fast. These too are best reheated in a moderate oven AND if your loaf of bread is stale run it under a cold tap and reheat in the oven which will result in it having a crisp crust. ~ Bring a large pot of lightly salted water to a boil. ~ Place the leftover pasta in a strainer or seive. ~ Dunk the strainer in the boiling water for no more than 30 seconds. ~ Lift out, drain and sauce as usual. Reheat this in a lidded saucepan, it will probably need a little more sauce so either add more of the same, a little cream if appropriate, a splash of stock, wine or even water! Stir gently turning the pasta over till hot all the way through. A microwave OK for this. This is a good time to use the microwave, but just at first, and is a great way to reheat leftover mac and cheese! ~ Preheat oven to 190ºC/375ºF/170ºC fan/gas 5.~ With the microwave on medium power heat the leftover pasta bake till fairly warm. ~ Pour over a little fresh sauce or cream. ~ Sprinkle with grated cheese and some breadcrumbs and till hot, crisp and golden. Just re-stir-fry them in a hot frying pan being attentive to the stirring so as to give all the grains of rice and additions a chance in contact with the heated pan. 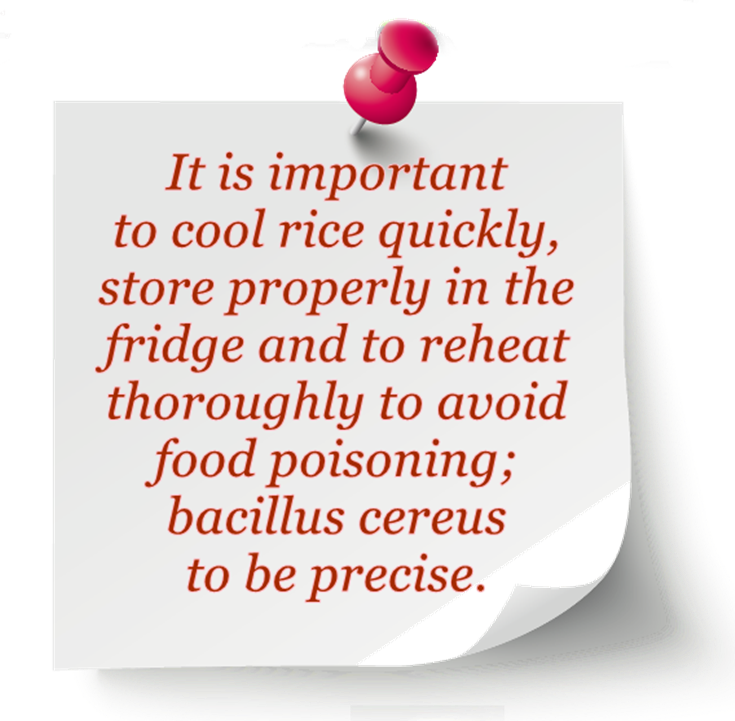 Make sure the dish is absolutely piping hot throughout as reheated rice can cause food poisoning of not treated correctly. Boiled and steamed vegetables – melt a knob of butter (relevant joke here!) in a pan and toss the vegetables in the hot butter till heated through. You can do these in the microwave too but not for long or they will overcook. Roasted vegetables – spread in a shallow pan and pop into a moderate oven till hot through. Sauces such as Hollandaise, Alfredo and similar are best heated in a bowl suspended over a pan of simmering water but can be achieved with care using just a pan and low heat. Stirring is necessary here too! If the sauce splits, which is particularly likely with Hollandaise Sauce stir in a knob of butter to re-emulsify it. 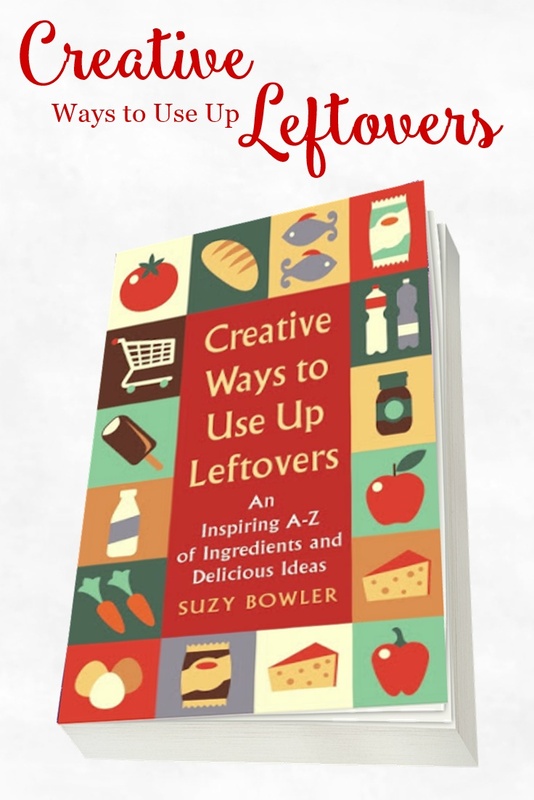 Remember, if you do fancy doing more with your leftovers than just reheating them then this is the book for you! Again, do this in a lidded saucepan as above but it will probably need a little more sauce so either add more of the same, a little cream if appropriate, a splash of stock, wine or even water! Stir gently turning the pasta over till hot all the way through. Microwave IS OK.
Sauces such as Hollandaise, Alfredo and similar are best heated in a double boiler or in a bowl suspended over a pan of simmering water. Stirring is necessary here too! If the sauce splits, which is particularly likely with Hollandaise Sauce stir in a knob of butter to re-emulsify it. Boiled vegetables – melt a knob of butter (joke) in a pan and toss the vegetables in the hot butter till heated through. You can do these in the microwave too but not for long or they will overcook. Get Sudden Lunch direct to your Inbox! 10 Interesting Ways to Use Leftover Pastry Scraps plus a Boring One! Delicious Ways to Use Panko Crumbs! How to make Rumtopf aka Rumpot – a brilliant use of summer fruits. Suzy Bowler. Powered by Blogger.